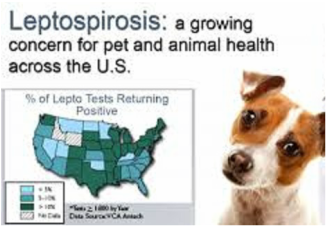 Leptospirosis (lepto for short) is a serious bacterial disease of many species including dogs and humans. Lepto is usually spread through exposure to urine of an infected animal. Dogs typically become infected when they come into contact with wet grass, soil, puddles, streams or ponds contaminated with the urine of infected wildlife such as racoons, squirrels, mice, rabbits, or deer. Direct contact with wildlife is NOT required! The bacteria can also enter through a cut on skin or the mucous membranes (eye, nose, or mouth). Lepto infections can lead to life-threatening kidney and liver disease. Leptospirosis is a zoonotic disease - meaning that humans can become infected after exposure to an infected dog's urine. Thankfully, vaccination is possible to protect your dog and the rest of the human family members!